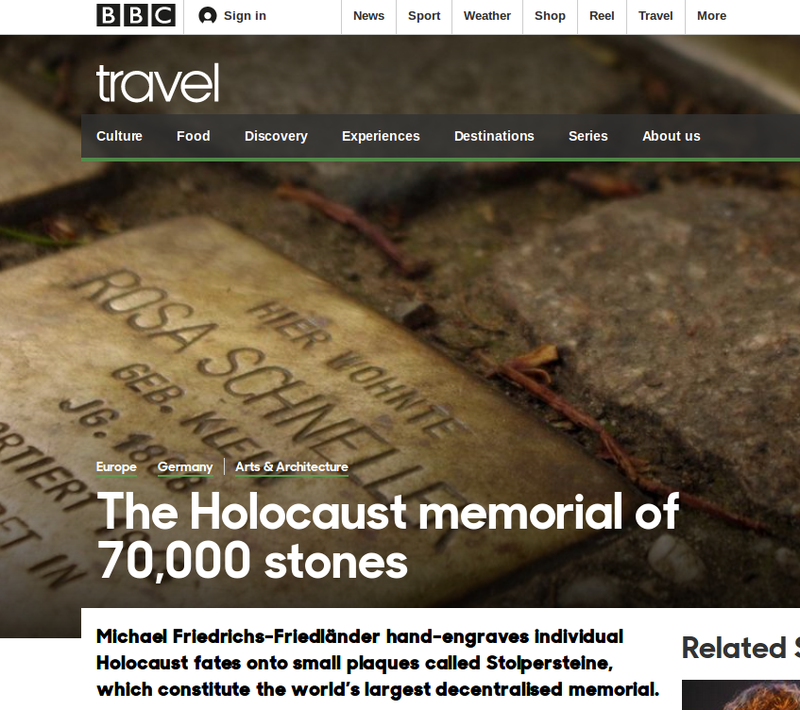 Headlining article in the BBC on the Stolpersteine | | Initiative Stolpersteine für München e.V. There are now more than 70,000 of these stones around the world, spanning 20 different languages. They can be found in 2,000-plus towns and cities across 24 countries, including Argentina, Austria, Belgium, France, Germany, Hungary, the Netherlands, Russia, Slovenia and Ukraine. Together, they constitute the world’s largest decentralised memorial. For all this international reach, the Stolpersteine are highly individual in form. The project’s motto is ‘one victim, one stone’, referencing a teaching in the Talmud, the book of Jewish law, that ‘a person is only forgotten when his or her name is forgotten’. Each plaque’s inscription begins ‘HERE LIVED’ in the local language, followed by the individual’s name, date of birth and fate. For some, this is exile to another country. For others, it is suicide. For a few, it is liberation from a concentration camp. But for the vast majority, it is deportation and murder. The Stolpersteine also foster relationships between present-day residents of a building or street. The majority of stumbling stones are researched and funded by local neighbourhood initiatives. Dietmar Schewe, a retired school principal in Berlin, recently coordinated a set of stumbling stones with his neighbours. “It was really the first time our apartment building felt like a community” he said. Likewise, the stumbling stones can reunite a victim’s surviving family members. Those who undertake the research required to produce a Stolpersteine must make contact with as many of the victim’s relatives as they can find – both to secure their approval and to invite them to the stone-laying ceremony. “First The Guardian and now the BBC have now joined the NY Times, the New Yorker, the Washington Post, Foreign Affairs and other of the world’s leading media in reporting on the Stolpersteine,” comments Terry Swartzberg, chairperson of the Stolpersteine chapter in Munich, in which 89 of these commemorative plaques have been placed – at 29 locations.